HFCU Card Alerts Service uses the smsGuardian™ text alert service, which is a FREE service available to you to help keep track of your daily transactions, and also safeguard your accounts from fraudulent activity that could take place. It gives cardholders the ability to receive and respond to text alerts for any approved or declined transactions with their HFCU credit or debit card. The cardholders will receive text alerts on their cell phone with their enrolled Visa® or ATM cards. Sign up all your HFCU cards today! Depending on the type of alert, the text may contain additional verbiage to identify the type of transaction, location of transaction, or if the transaction was performed via the internet. If transaction is unauthorized, cardholder should reply to text message with the proper code within 12 hours of receiving the text message. After 12 hours, the member would need to contact the Fraud Center or HFCU to report any unauthorized activity. Cardholder will receive a reply text from smsGuardian, confirming card is now blocked. 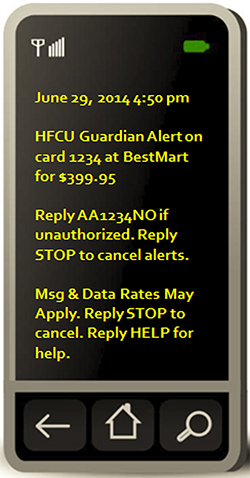 If cardholder replies STOP, all future smsGuardian text alerts will be stopped for any card with that device enrolled. The cell phone or mobile device must have the ability to send and receive text messages and the use of “short codes” must not be blocked. Short codes are special telephone numbers, often five digits long, which are used to send text messages from mobile phones. You are responsible for any text messaging fees from your carrier, message and data rates may apply. This service is available for the following carriers listed at: https://www. cardguardian.com/CardGuardian/carriers.do.